The Annunciation Triptych, as this work is known today, is in fact the result of a 20th-century reconstruction. It was first dated by Wilhelm Bode, who placed it at the end of the 13th century, and subsequently by Max Friedländer and E. Buchner, who proposed the dating accepted today. What is now the central scene of the triptych, The Annunciation, originally formed the two outer wings, while the original central panel is now lost. These outer wings were detached in 1929 and joined together to create the central image as it appears today. The four figures seen when the triptych is open stand out against the background, which is green in the central panel and dark blue in the lateral ones, dotted with tiny red flowers. 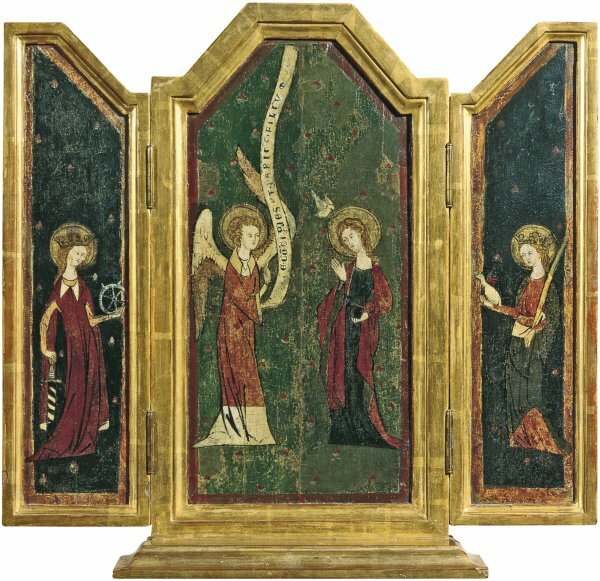 The wings of the triptych in its present form depict two female saints: Saint Catherine on the left, holding a small wheel, and Saint Agnes on the right, holding a martyr’s palm and her attribute of a lamb, symbol of purity. Overall, this work has been related to an Annunciation by an anonymous Cologne painter, now in the Bayerische Staatsgemäldesammlungen in Munich. In its present form this small triptych constitutes a skilful reconstruction dating from the early 20th century. The triptych was acquired for the Rohoncz collection from the Hermann Ball gallery in Dresden in January 1929. Prior to its acquisition, written opinions were requested from Wilhelm Bode, who dated it to around the late 13thcentury, and from Max J. Friedlander, and from E. Buchner, both of whom dated it to around the mid-14th century. The painting was formerly in the Weyer collection and was auctioned in Cologne between 25 and 30 August 1862, appearing in the catalogue of the sale. From the Weyer collection it passed to that of the Prince of Hohenzollern in Sigmaringen where it remained until it entered the Thyssen-Bornemisza collection. From the descriptions of the work during its time in the Weyer and Hohenzollern collections, we know that it was displayed with a central image of an Adoration of the Magiof square format dating from around the early 15th century, and that this arrangement dates from the time the painting was in the Weyer collection between 1852 and 1859. The Adoration of the Magi was removed and possibly sold separately when the painting left the Prince of Hohenzollern’s collection. The triptych’s present central scene with the two figures of The Annunciation originally constituted the exterior doors. These two panels were removed from their original placement and combined to form the principal image. This is how the triptych was presented in an exhibition held in Düsseldorf in 1929 on Old Masters in private collections, and it was with this arrangement that the painting entered the Thyssen-Bornemisza collection. The original central painting (which was not The Adoration of the Magiadded while the triptych was in the Weyer collection) and its subject matter are now unknown and there are few surviving works of this period with which the present work can be compared. The figures stand out against a uniform background dotted with small red flowers. The background is pale green in the case of The Annunciation and dark blue in the lateral wings. The saints looking towards the principal scene are Saint Catherine, on the left, holding a small wheel in one hand and a sword in the other, and Saint Agnes, who holds a martyr’s palm and her attribute of a lamb, symbol of purity as well as a reference to her name and to an episode in her life. The four figures are outlined with a clear black line that also defines the folds in the cloaks and tunics and the haloes, crowns and other elements. The figures have been compared to those on two exterior doors that also depict an Annunciation, attributed to an anonymous Cologne painter and dated around 1360 (Bayerische Staatsgemäldesammlungen, Munich).